Oooh! 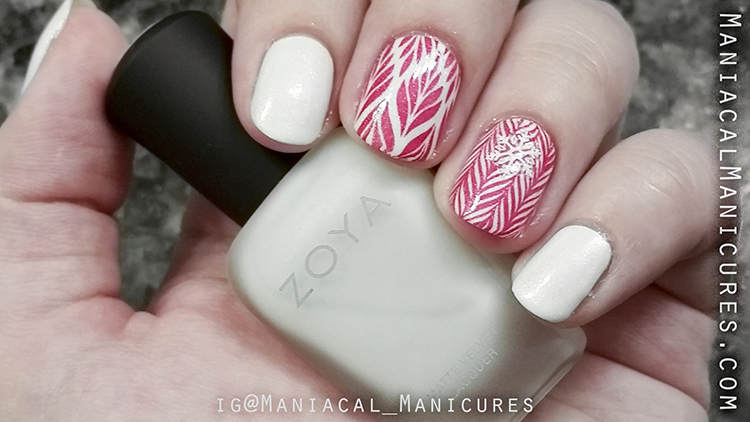 Candy cane colors! I didn't have the intention of purchasing them because they're candy cane colors, but for the timing of the post, it's convenient. Today we have Amal and Aspen. 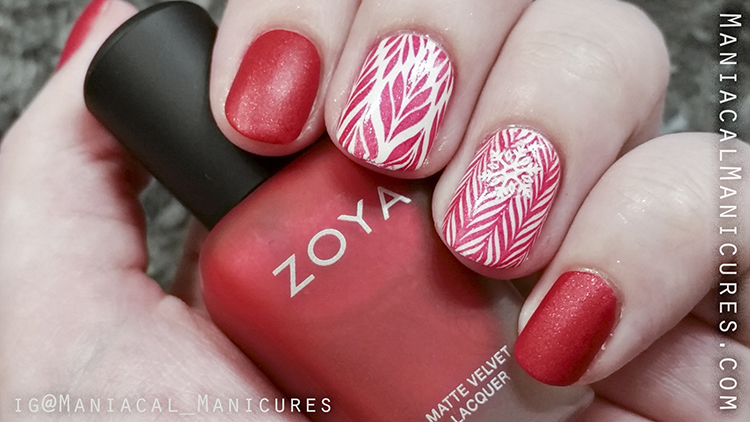 When Zoya announced they were introducing the Winter 2015 Matte Velvet Collection, I initially had a mixed reaction. I was happy that they were bringing back a popular finish, but I sighed at the color options. I have an ongoing love/sigh relationship with Zoya's matte velvet polishes. Primarily my sigh has been the color options. I understand Zoya wants to create staple colors that both appeal to a large audience as well as have longevity in the market, but the colors are so...redundant... I think Zoya is smart for providing a gloriously obtuse selection of colors, but I would love to see more daring colors/combinations from them. Remember the understated gold cellophane Maria Luisa? Now that I would love to see in silver! More after the jump! As a nail polish lover, I appreciate the variety of finishes and treatments that have been made available, especially for nail art. It's important to be aware that matte polishes are not traditionally as durable as gloss polish, and that to avoid early chipping one needs to apply a topcoat (gloss or matte). One variable that affects the final appearance of any matte polish is actually which matte topcoat you use if you elect to use a matte topcoat. Matte topcoats are composed of a clear base with a pigment-material that is non-reflective and diffuses light, rendering a flat appearance to both the topcoat and any layers visible underneath. But not all matte topcoats are created equal, thus different brands result in varying appearance. In another post I will provide swatches showing examples this! In the case of Zoya's matte velvet polishes, this most recent collection's formula is different from their last; the polishes each have opalescent flakes which give them a pearl-like luster. If you are interested in the finish most promoted by Zoya via their swatches and advertisements, simply apply 2-3 thin coats of any matte velvet polish over a basecoat and you're done. If you elect to layer a matte topcoat, be aware that it flattens the appearance of the flakies and makes the polish look even more "flat." If you use Zoya's Matte Velvet Topcoat, be aware that it diffuses the finish and makes it more "fuzzy," making the polish look more like the original matte velvet polishes rather than the advertised pearl-fleck. 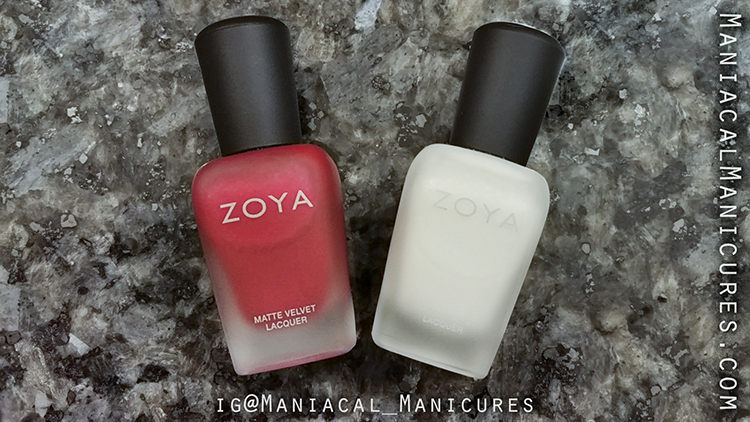 While I love Zoya's Matte Velvet Topcoat, especially over cremes (it makes some of them look so luxe! ), it doesn't do much for this collection. Now, I am by no means the first, but have you seen these darlings with glossy topcoat?! They just sparkle and practically glow! This is my favorite way to wear them when not using them for nail art. I have a special love for Aspen because it was what I wanted Zoya's Genesis to be (Genesis was too sheer, streaky, and not enough sparkle for my preferences). Aspen is below with three thin coats over Zoya Naked Base and topcoats where noted. I am in love with this polish because it is a crisp white with plenty of subtle sparkle. I adore this with gloss topcoat, and for being crisp it looks very soft. I adore white polish with sparkle, and Aspen is generally fully opaque in three thin coats. Be aware that Aspen is one of the thicker polishes from this collection and requires a lighter hand with less manipulation to come out smoothly. I had a little bit of a hard time with this at first, but the results are worth the patience! I wish more of the sparkle had come through my photos, but alas! Below is Aspen on all fingernails with Amal stamped over the middle and ring fingers using hēhē™ Stamping Plates Fairy Tale - 005. 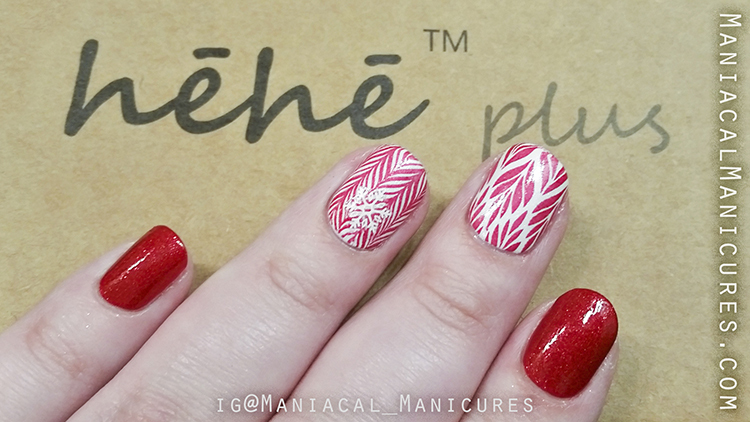 A small snowflake nail sticker was applied, and similar items can be found via eBay. No topcoat has been applied to the following image. The following is Aspen with a glossy topcoat applied to all fingernails. It was so bright it drove my camera settings nuts. It is a pure crisp white, but there are sparkles, I swear! Amal is below with two thin coats over Zoya Naked Base and topcoats where noted. I originally hadn't planned to pick up Amal (I had my eyes only for Aspen), but after seeing it gloss-topped I succumbed to the temptation. 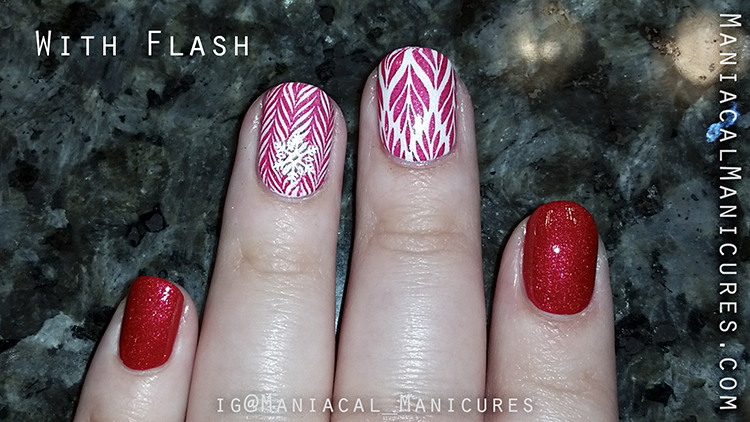 While Amal isn't the most original sparkly bright red, it was wonderfully soft without being shy on sparkle. Despite having China Glaze Ruby Pumps as a staple in my stash, I love that Zoya Amal is opaque. Sometimes I don't want to fuss with a nail line when enjoying a sparkly red. Be forewarned! This one is a potential stainer! When I was cleaning up around the cuticle, and then after removal, my skin was slightly pink-tinged. It does come off with remover and a light bit of scrubbing. Two thin coats over Zoya Naked Base with no topcoat on index and pinky fingernails. 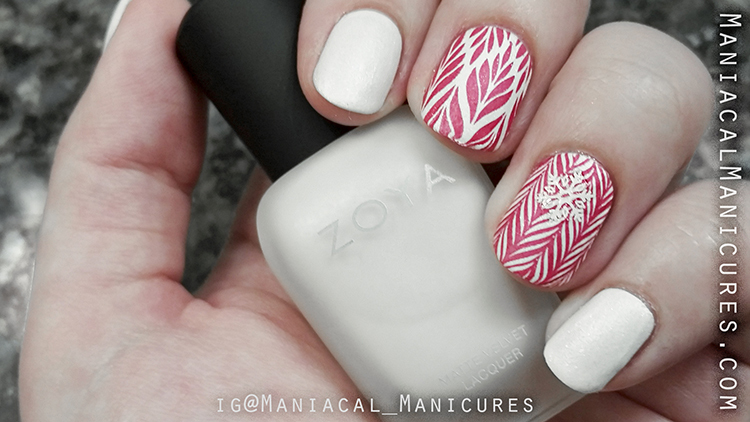 Aspen is stamped with Amal on pointer and ring fingernails with topcoat. 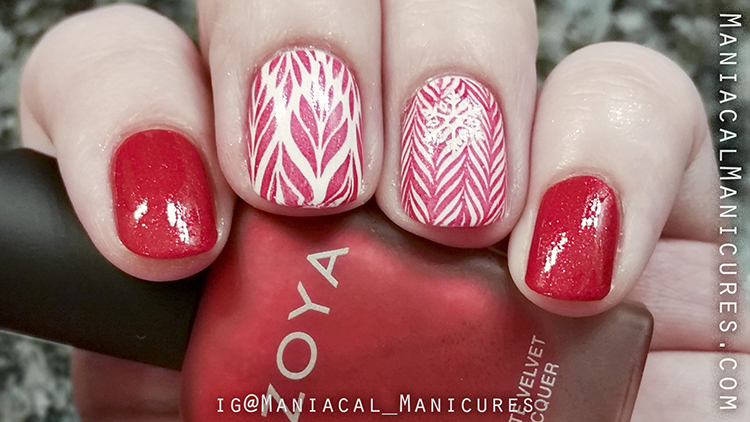 Amal makes a great red stamping polish over white, though I have yet to try it over other colors. Below is with topcoat on all fingernails. I mean, just look at all the sparkles! I had to use my camera flash to show off just how many sparkles weren't showing up on camera that you can see in person! Okay, I'll stop...after one more! I purchased my Creative Shop Stamper from Color4Nails.com. hēhē™ Stamping Plates can be purchased directly from their Website.